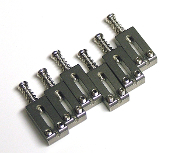 Stainless Steel Saddles Set of 6 Fits tremolo, tele, and hardtail bridges. 10.5mm option is for Import & MIM Standards. 10.8mm option is for US Standards. Check your measurements carefully and ask any fit/compatibility questions prior to purchase.